Follow Iceland's famous Ring Road and make the most of long daylight hours on this summer adventure. Discover Iceland's two cities, Reykjavik and Akureyri, and the volcanoes, waterfalls and glaciers that make up the countries dramatic landscape. After checking-in to our conveniently-located hotel in the city, you may have time to explore a little of the world's most northerly capital. Bustling with cosmopolitan energy and surrounded by pure, unpolluted nature, Reykjavik is a city of striking contrasts. Small colourful corrugated iron houses nestle next to futuristic glass buildings; state-of-the-art facilities lie beside rugged volcanic terrain and international influences mingle with Icelandic national traditions. All this creates a culture where old embraces new. On this holiday you'll be accompanied by a local guide from days 2 to 9, so this evening you are free to settle in and enjoy the diverse dining and, maybe even the nightlife, of this tiny and strikingly located capital city. This morning after breakfast the adventure begins. Travelling along the south coast we will begin to see how rugged Iceland truly is. Our first stop will be Seljalandsfoss Waterfall, where we will have the chance to walk behind the falling waters and see the waterfall from the inside. The melting glacier atop of infamous Eyjafjallajokull Volcano feeds this cascade and the constant spray from the falls results in colourful wildflowers in the meadow below and rainbows when the sun shines down. We'll then move on to Skogafoss, which at 60m high and 25m wide is very impressive to get up close to and should you wish to climb the 370 steps to the top you will be rewarded with excellent views over the crest of the waterfall and out towards the sea. As we travel along the coast we will spend some time at Reynisfjara Black Sand Beach, a bay surrounded by wondrous basalt columns and the dramatic Atlantic sea. From the shore we will see the oddly shaped Reynisdrangar stacks out in the ocean and if we're lucky we'll spot the resident puffins, fulmars and guillemots. Tonight we stay in small, simple cottages and dinner will be included in this rural and quiet setting. Today we'll visit Skaftafell, an area of wilderness inside the larger Vatnajokull National Park. Another day, another waterfall and todays will not disappoint. Svartifoss translates to Black Fall and it's easy to see why this waterfall adopted its name being framed perfectly by downwards facing black basalt columns. We will enjoy a half an hour walk along gravel paths to reach this gem that's hidden away from any main roads. Our final visit of the day will be to Jokulsarlon Glacial Lagoon known as Iceland's Crown Jewels. Here the lagoon waters are speckled with icebergs and the surrounding black sand beach is littered with large, crystal-like chunks of ice. We'll take an exciting 30 minute boat ride to see the blue-hued icebergs up close and search for seals lounging on the floating ice. Heading further east to Hofn, tonight we'll have time to relax and enjoy the curious experience of night-time sun. Hofn means harbour and on arrival it will be easy to understand the name as it's surrounded by oceans on three sides sitting on a small peninsular. The langoustine in this area receives rave reviews and is served in most restaurants, so be sure to try some. The lesser-visited East Fjords are a stark contrast to the flat, black sand beaches of the south coast and as we journey along we will see where glaciers carved deep into the mountainous green terrain over thousands of years. We'll leave the Ring Road to follow the natural bends of the fjords. Small fishing villages are dotted along the shorelines at the bottom of the white-capped mountains and herds of reindeer graze on the hillsides. Along the way we'll visit some of the villages to experience the slow pace of life in this rural area and enjoy the natural surrounding beauty. Djupivogur is a historic trading village dating back to the 1589 and due to being nestled between two large lagoons is very rich in birdlife including the much loved puffin. In Faskrudsfjordur, also an old trading post, we'll have some free time where an optional visit to an isolated museum surprisingly dedicated to curious involvement of French fishermen in Iceland's past! We'll continue our journey inland to the Wilderness Centre in time for lunchtime to allow us plenty of time to enjoy this wild surrounding. Here we will experience true Icelandic culture as we enjoy a traditional cooked dinner and sleep in either the 1940's originally-restored farmhouse or in what is by day a museum. The farmhouse features 4 twin rooms which have been decorated in the fashion of times gone by and are true to the taste of the past owners, including original furnishings and objects. Whilst the museum offers a dormitory-style arrangement under a turf roof has been created to show how families would have lived in the not so distant past. Families traditionally slept and lived in close quarters and this main dormitory room would have been the heart of any family home where the fire burned and the sagas were shared from generation to generation. Please note that the group will be split between the dormitory museum and the old farmhouse and rooming arrangements will be decide by the local guide dependent the make-up of the group. Facilities are simple and bathrooms are shared. Today we head north to the northernmost village on mainland Iceland, Raufarhofn. The scenery along the way changes from the dramatic fjords of the east coast to a wild and desolate terrain in the forgotten region of Melrakkasletta. Taking a break from our Ring Road itinerary, we will leave Route One to discover an area where birds outnumber humans and the striking effects of Mother Nature are visible all around. On the way we will visit Bustarfell Museum, an old traditional turf house dating back to 1770 and have time to relax in the hot geothermal waters of a pool perched on the edge of the Sela River. We'll also take time to explore the natural beauty of Raudanes Peninsula; abundant in birdlife, scattered with curious rock formations, hidden beaches and caves engraved with messages from shipwrecked sailors over history. Raufarhofn sits just 40km south of the arctic circle and experiences some of the longest daylight hours in all of Iceland. Dinner will be included at our hotel. Our first stop of the day is the thundering giant that is Dettifoss Waterfall, Europe's most powerful falls with an amazing 44,000 litres of water tumbling over the crest every second. Dettifoss is Iceland's 'Beast' due to sheer cliffs and clouds of mist that can be seen from several miles away, whilst Godafoss in the south is known as 'Beauty' and here we will need to wear our waterproofs to enjoy the spray and roar up close. Next we will visit Asbyrgi, an enormous rock formation said to be the hoof print of Sleipnir, God Odin's eight legged horse, whilst other legends tell tales of these towering vertical cliffs being home to Iceland's hidden people, the Huldufolk. Our local guide will tell us more! This afternoon we'll stop at Husavik, a bustling fishing town on our way to Akureyri. Husavik is traditional and quirky, with a boat lined harbour, some great shops and restaurants and the argued crown of being the first settlement in Iceland in 870 AD (Reykjavik vies for this title too!). Tonight we'll arrive in the 'capital of the north', Akureyri where we will stay for the next two nights. Iceland's second city has a wide array of places to enjoy an Icelandic meal and a great spot to enjoy the long daylight hours as it is surrounded by mountains and sea. This small and extremely picturesque city is famous for being unexpectedly home to the world's northernmost botanical garden which contains a wide array of native and foreign flora, as well as art galleries and a Lutheran Cathedral. Today is free for you to explore this laid back city or you may choose to join a local food and city walking tour where you can discover the best of the local North Icelandic products such as locally sourced seafood, their famed free-roaming lamb and fresh bread. Alternatively if you'd like to see more of the surrounding countryside then you can join an optional trip to Lake Myvatn, a volcanic lake formed 3,800 years ago when a lava flow blocked the valley and which is now one of the most fertile spots in the world and attracts a wide range of nesting ducks. Or perhaps going in search of Eyjafjord Humpback whales off the coast will be a preferred option today! Once again we will leave the beaten track today and head north to Siglufjordur village. Once the herring capital of the world, Siglufjordur is now a quiet and isolated town that boasts small, independent museums (mostly about herring!) and offers a brilliant insight into how little communities live in the far north. We'll then continue to follow the edge of peninsular around until we reach Hofsos, home to Iceland's only 'infinity' pool. Although not officially an infinity pool, Blue Infinity public baths was created by the architect of the famous Blue Lagoon for the local people of this remote town. The pool is perched on the hillside and its precarious position gives the sensation of endless waters that flow into the sea below and has spectacular views across the fjord to the distant mountains. After a three hour drive we'll arrive at tonight's accommodation on a working farm for a traditional stay alongside the resident cows, pigs, chickens and family dogs. Dinner will be a homemade meal including the farm's own produce where possible. Back on the road this morning, we leave our friendly farm location in search of the bright lights of the Capital, Reykjavik, via the highlights of Iceland; Geysir, Thingvellir National Park and Gullfoss Waterfall. Thingvellir translates to 'the fields of parliament' and was once the meeting place of more than 30 clan leaders in 930 AD who came together to reconcile differences with the aim to finally become a united nation after years of turbulent fighting. For this reason Thingvellir plays a very important role in Iceland's heritage and culture but what's also fascinating is it geology. The west half of Iceland sits on the North American tectonic plate and the east half sits on the Eurasian tectonic plate and here at Thingvellir is the only place in the world where the Mid-Atlantic Rift can be seen above sea level and we can take a walk between two continents. We move on to the 'Beauty' of Iceland, Gullfoss Waterfall. Arguably Iceland's most beautiful waterfall, here the water plunges into a deep ravine with tremendous force whilst its mists form colourful rainbows in the sun. Finally we'll come to the geysers situated in a highly active geothermal area, here we will be able to see Strokkur which spouts water 100 ft into the air above, as well as The Great Geysir after which all other geysers have been named. 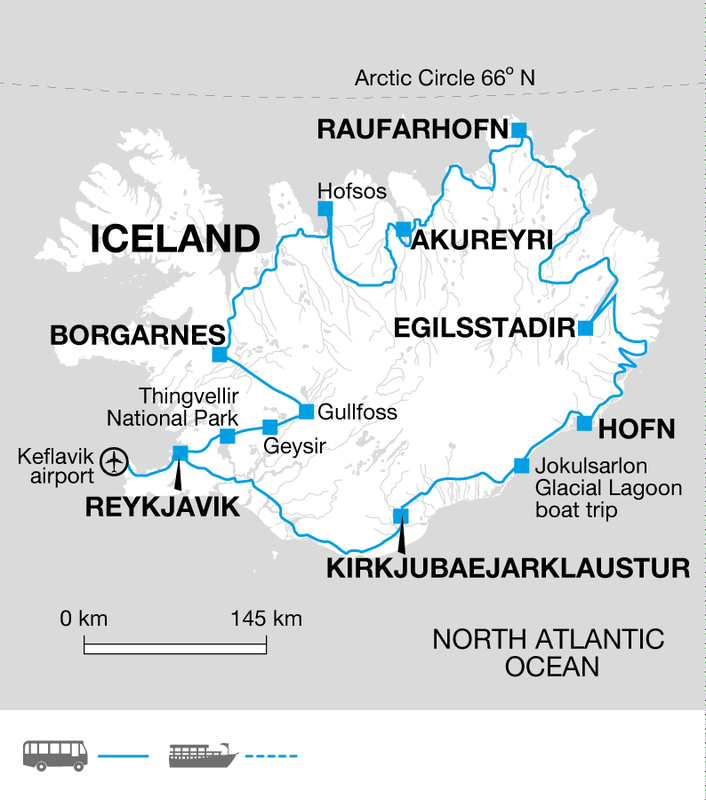 This evening we'll arrive into the capital having completed the full circle of Iceland. We'll be able to celebrate this accomplishment in one of Reykjavik's many eateries or pubs before saying goodbye to our local guide as our trip comes to an end. Our trip ends after breakfast this morning. The transfer back to Keflavik Airport will be on the public FlyBus shuttle bus service and your local guide will provide you with the details of your departure time and voucher for this service. In Iceland weather conditions can change rapidly - sunshine, drizzle, rain and snow may all occur in the same day. You'll need warmer clothing for outdoor activities and cooler evenings, so pack layers. A good quality wind and waterproof jacket and trousers are essential. We also recommend that you bring a swimming costume plus a towel with you as there will be plenty of chances to swim on the tour. If you are planning to join a whale watching excursion then we recommend wrapping up warmly as it can be very chilly out at sea, so take a woolly hat, scarf, jumper and gloves with you. We recommend taking walking boots with a sturdy tread and also trainers. Soft indoor shoes are recommended as it is normal in Iceland to have special house shoes. For swimming you may also find a pair of flip flops useful. One main piece of baggage, a soft grip bag is ideal (not a framed rucksack) and a small daypack. Tipping is not a recognised part of life in Iceland for meals etc, though if you do wish to tip your local representative (entirely at your discression) it will no doubt be appreciated. Throughout this trip we use simple accommodation. The majority of hotels in Iceland are decorated in a plain style and many weren't originally built as hotels, but were instead converted from things such as old schools. Rooms can be small and the facilities can be basic. Most accommodation won't have hairdryers or teas and coffee making facilities in the room and some may not have a television, but the scenery outside is so stunning that after a busy day exploring you're unlikely to miss having one. Reykjavik accommodations will have private bathroom facilities but elsewhere bathroom facilities will be shared. Due to the recent considerable rise in tourism in Iceland, hotels are experiencing very high demand for rooms and there have been some occurrences of overbookings, which are often notified to us at a late stage. For this reason, we would like to emphasise that hotel accommodation is subject to change, which may result in the need to alter your night stops with little or no notice. Explore are working closely with our team on the ground to minimise changes to accommodation, although in the case of unavoidable hotel changes, we will endeavour to always provide accommodation of the same or a higher standard. Iceland is a destination where you can still get up close to its many and varied natural attractions. You can touch the point where tectonic plates meet, feel the spray of roaring waterfalls against your face and stare in awe as icebergs float pass you. The people are friendly and have a wonderful sense of humour. They'll tell you tales of elves and Norse gods, which have helped to shape this magical island.